I could not wait to take another look at “St. Paul A.M.E. Church, 1873-1987 114 Anniversary Celebration,” which I first went through in 2007 when my daughter and I visited Salt Lake City. At that time, I scanned through quickly for the name of my great great grandfather, Beverly Vance, because I knew his family went to church here early on after emancipation if not before. I saw somewhat disappointed because his name was not mentioned. Neither did it mention his son, Rev. Lafayette Franklin Vance, who would have attended when a child. 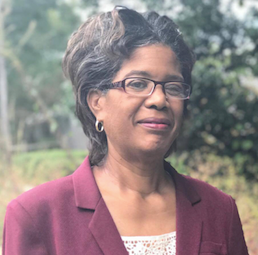 You may ask, “Why were you now so excited to go through the book again?’ I had been given the chance to live in Greenwood County, South Carolina. Even though it was named Abbeville County back when my family lived there, today it is Greenwood County. I got the chance to see who was buried in Save All Cemetery. The Arnold’s were buried there, and they attended St. Paul A.M.E. Church. See African American Genealogy: Are You Working the Cemetery for Pre-1870 Clues? My second look at “St. Paul A.M.E. Church, 1873-1987 114 Anniversary Celebration,” at the Family History Library. Photo by Robin Foster on Monday, February 25, 2019. Columbus Goggins (1845- ) attended St. Paul A.M.E. and is buried in Old Tabernacle Cemetery alongside other African Americans. Old Tabernacle Cemetery is a Confederate cemetery, and before that it was a Methodist cemetery. Seventy-six year old, Mason Goggins, was buried in the Old St. Paul A.M.E. Church Cemetery, a site that existed before the current church was built. 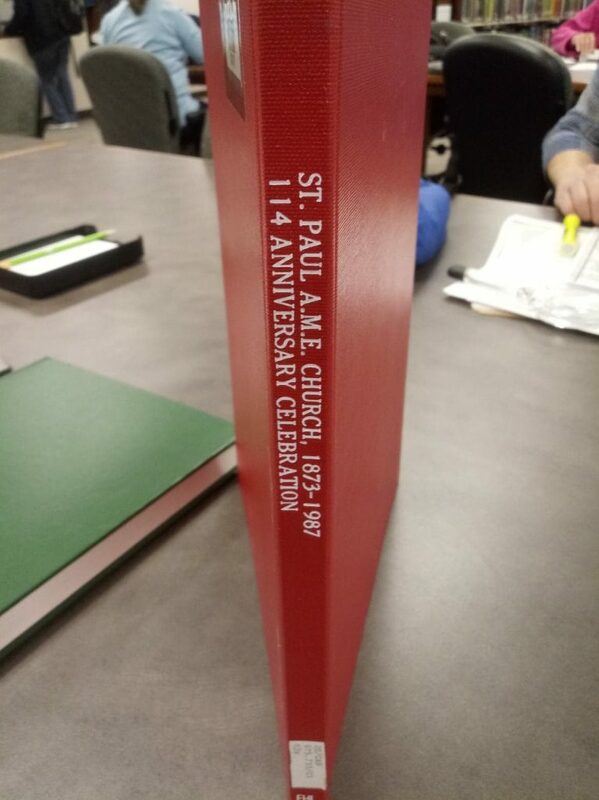 The cover, St. Paul A.M.E. Church, 1873-1987 114 Anniversary Celebration. Photo by Robin Foster on Monday, February 25, 2019. This is the current at 4222 Cokesbury Rd, Hodges, South Carolina, (864) 374-7380. This is the third building. My ancestors would have attended as a family when the church was located near Payne Institute. Beverly and Matilda Vance with their children including Lafayette before the year 1863. The first St. Paul’s A.M.E was “built over a century ago. 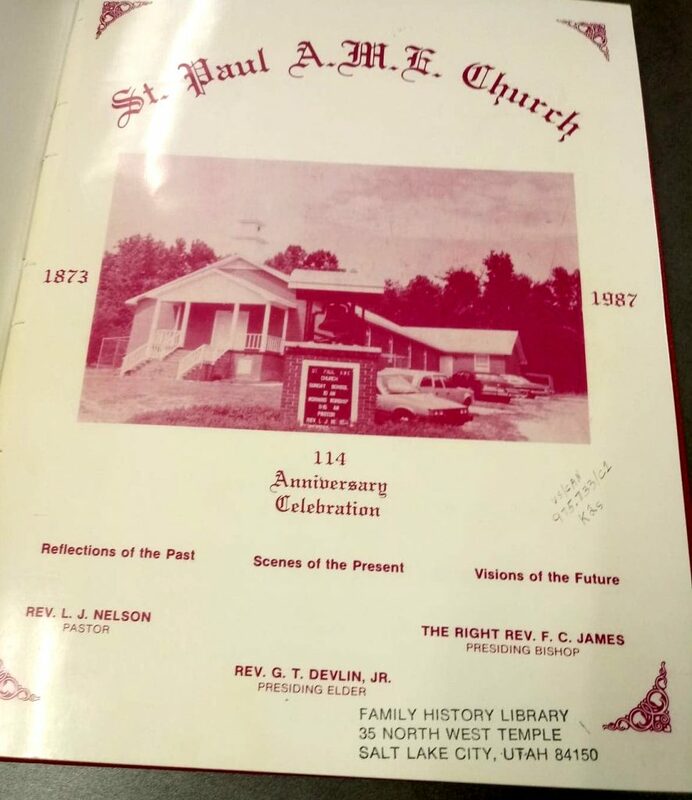 The original place of worship in an old school house under a hill on land that was near or part of the property purchased for Payne Institute,” St. Paul A.M.E. Church, 1873-1987 114 Anniversary Celebration, page 11. “The second St. Paul according to a date on the cornerstone, was built in 1863. Reverend D. H. Johnson was the pastor. With an increasing membership, officers and members saw the need for the need for a larger church and built a new structure on a hill just above where the old church stood. This church was used for many events of the community. It became the gathering place,” St. Paul A.M.E. Church, 1873-1987 114 Anniversary Celebration, page 11. The Vance’s would have still been attending St. Paul A.M.E. Church in this second building until 1883. Can you find the place where your ancestors lived after enslavement? I went to the site and took photos were the church and Payne Institute once stood. That why this description of the two buildings are so important. I will blog about them in an upcoming post. 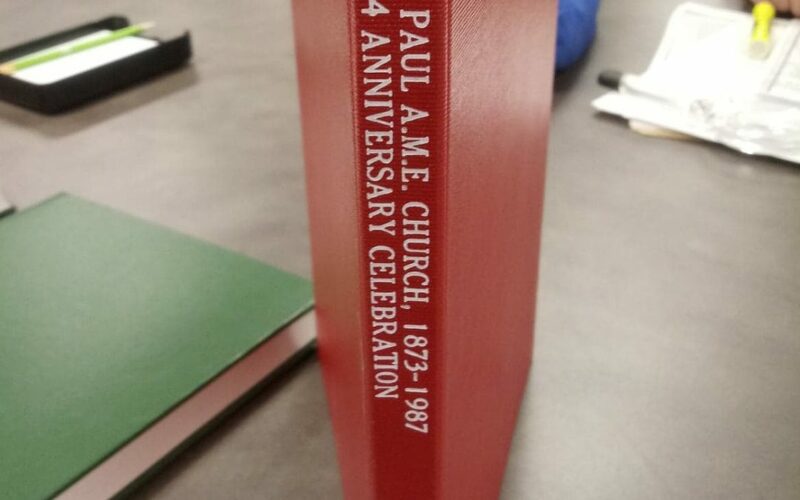 Have you sought out church anniversary books? It may only be a page of history, but the book may give you clues: names of first pastors, buildings, older members. Let us know what you have found on the Facebook Group.